Mega Sale! Save 29% on the Urijk Unicorn Toy Storage Basket, Round Canvas Animal Kid Baby Girl Laundry Storage Bin Hamper for Nursery Room, Waterproof Cute Cartoon Foldable Organizer for Office Bedroom Dorm, Dia 13” x 16”H by Urijk at Indsight. MPN: Mengor13X3Y18. Hurry! Limited time offer. Offer valid only while supplies last. Urijk laundry storage toy basket, very practical for organizing, you can use it as laundry basket, towels storage, baby toys organize and so on. ❤The unicorn laundry hamper is lightweight and portable for using,storing, and moving conveniently. ❤You can put it at anywhere you want, over your bed, beside the sofa,laundry room and so on. Great organizer basket for your room, make your house tidy and clean. ❤This unicorn laundry hampers can stand stably by itself no matter it is empty or filled as it is made of thick and paddy material, shaking makes it straight. ❤Material applied on baby clothes hamper are soft and natural, no need to worry about safety issue. Kids can definitely carry the bag buy themselves. ❤The unicorn storage basket helps children to learn how to organize their stuff and make everything ordinary as well as provide a safe place for playing. ❤Reinforced stitching handles firmly so that it has higher capacity,can be used for carrying heavy stuffs though it is small in size. ❤You kids, both boys and girls will definitely love the unicorn toy storage basket, you can buy different designs as present for them. 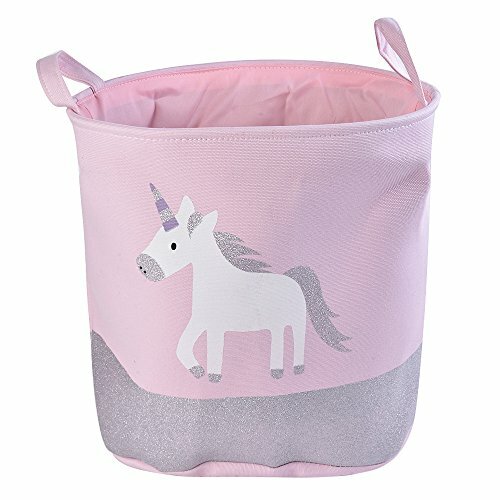 UNICORN & RAINBOW PATTERN Specially design unicorn and rainbow laundry storage basket, cute and popular among different people especially kids, great idea as a gift. Round laundry hamper is fun and adorable patterns, adds a splash of color to any room while also being functional. LARGE CAPACITY Size: Dia 13" x 16"H(33*40cm), big enough for hold lots of things. Perfect for storing toys, books, clothing, puzzle, dolls, diapers, baby blankets, clothes, socks, shoes. Make the room neat and regular. SAFE & ECO-FRIENDLY High quality 100% cotton fabric make these storage baskets soft to touch and beautiful. The EVA liner make this laundry basket can stand upright. We use a safe dye and the glitter decoration on the basket is eco-friendly. We carefully select all the material as we do it for kids laundry hamper. No harmful gas and dangerous tiny part on the laundry basket would threaten kids' safety. KEEP ROOMS ORGANIZED AND MINIMAL This large laundry basket can be used as a: laundry basket, kids toy basket, nursery basket, or as a blanket basket. You can put it at anywhere you want, over your bed, beside the sofa, laundry room and so on. Great for a nursery, kids room, playroom, craft room, bathroom, kitchen and closet organization etc. EASY TO USE These unicorn storage baskets with the handle on both sides, easy to carry. These large laundry storage baskets are foldable, space-saving and convenient to store. You can simply fold them up when not in use or travel. Please note there are some creases due to packaging, you can fill this storage basket with large items to remove ceases. If you have any questions about this product by Urijk, contact us by completing and submitting the form below. If you are looking for a specif part number, please include it with your message.